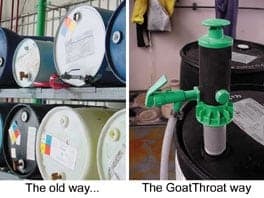 CORE COMPETENCIES: GoatThroat Pump’s unique technology help companies reduce hazmat incidents and save money at their manufacturing facilities by preventing costly chemical spills and the associated cost of reporting and manufacturing downtime. The systems mitigate worker compensation claims by preventing workers exposure to hazardous chemicals and by eliminating repetitive motion and other injuries. Gravity transfer from drums stored on their sides can cause leaks, spills and lost inventory. Leakproof, spillproof GoatThroat pumps are hand pressurized for quick transfer from vertical drums. Safe, simple and inexpensive, GoatThroat pumps are quickly making management of liquids easier and more efficient. These pumps are engineering controls for fluids which are designed to minimize the hazards associated when transferring liquids. Click on a title to download. Some of our products that people in the Government Industry use.